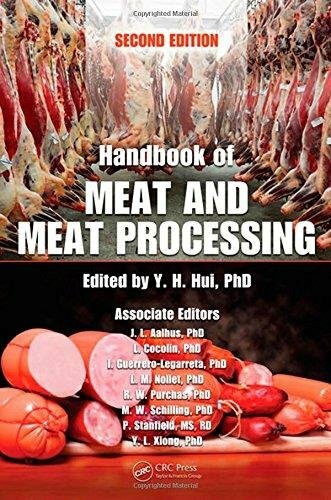 Retitled to reflect expansion of coverage from the first edition, Handbook of Meat and Meat Processing, Second Edition, contains acomplete update of materials and nearly twice the number of chapters. Divided into seven parts, the book covers the entire range of issues related to meat and meat processing, from nutrients to techniques for preservation and extending shelf life. Topics discussed include: An overview of the meat-processing industry The basic science of meat, with chapters on muscle biology, meat consumption, and chemistry Meat attributes and characteristics, including color, flavor, quality assessment, analysis, texture, and control of microbial contamination The primary processing of meat, including slaughter, carcass evaluation, and kosher laws Principles and applications in the secondary processing of meat, including breading, curing, fermenting, smoking, and marinating The manufacture of processed meat products such as sausage and ham The safety of meat products and meat workers, including sanitation issues and hazard analysisDrawn from the combined efforts of nearly 100 experts from 16 countries, the book has been carefully vetted to ensure technical accuracy for each topic. This definitive guide to meat and meat products it is a critical tool for all food industry professionals and regulatory personnel.